Rounded Shoulders? DON’T DO THIS!!! Kieran Finnegan- Your Chiropractor Sydney CBD. 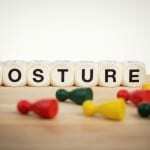 Over the years I have treated many people who have been given some bad advice in regards to posture and more specifically how to sit and/or stand to help correct rounded shoulders, although the therapist/professional may of been well intentioned, however; inevitably it made things worse. 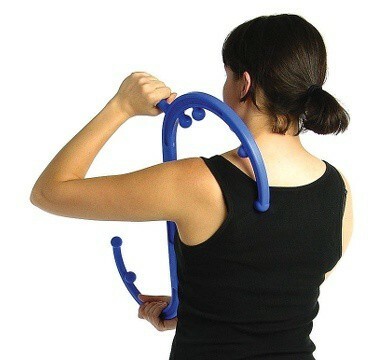 People with rounded shoulders are often told to forcibly pull their shoulders blades back and down. This is actually a un-natural posture and it uses your postural muscles in a way they were simply not designed to do, i.e, in a constant and sustained contraction. What happens when the shoulder blades are pulled back and down is the upper trapezius is placed under a lengthened contraction, or more accurately referred to as an eccentric contraction, while simultaneously the lower trapeszius muscles are under a constant shortened contraction. 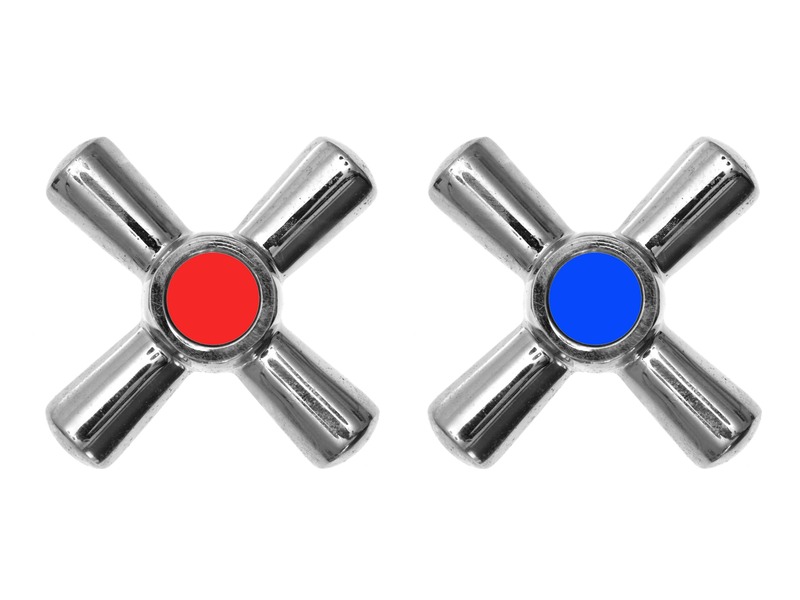 Both of which are not useful but it is the eccentric contraction that tends to cause the most pain and tension. If you can imagine the upper trapezius as an elastic band (red arrow) that runs from the of neck to the top of the shoulders. 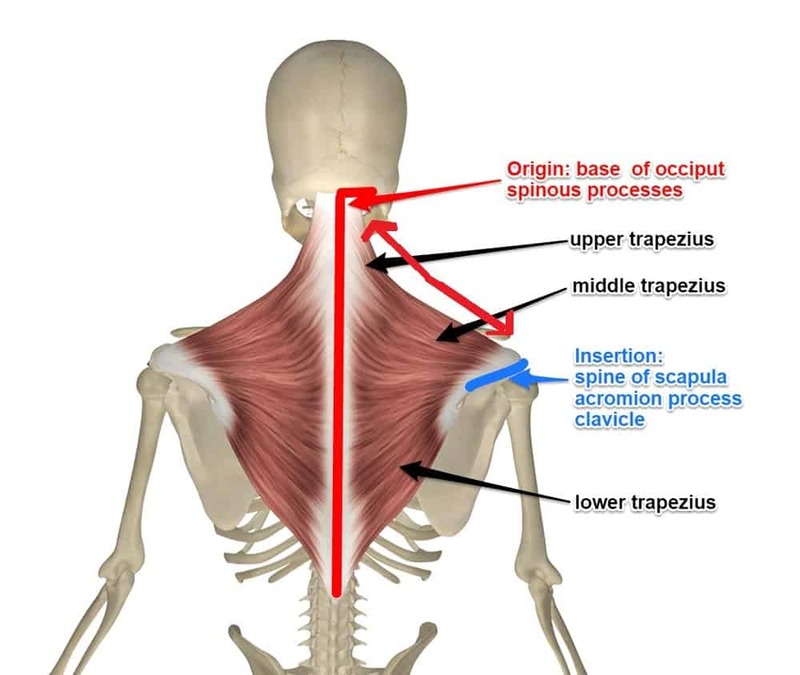 As the shoulders are being forcibly being pulled down the upper trapeszius is under constant tension as either ends of the muscle are being pulled away from each other. Similarly, if you were to pull the ends of an elastic band away from each other you will notice the tension actually increases dramatically. It then becomes a viscous cycle, as the longer and more frequent someone does this the more tension and pain is created and they more they will forcibly contract their muscles in an attempt to relieve the tension and pain. 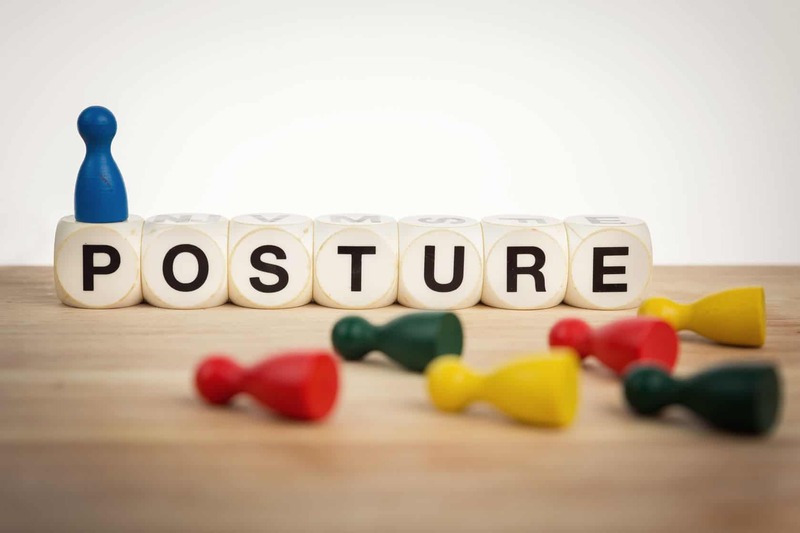 A much better postural cue would be to stand tall, relaxed with a lengthened neck as if their is a helium balloon attached to the crown of your head and creating a very light traction and the shoulders rolled back slightly. This way the muscles are being used correctly, the spine is in better alignment and rather than causing tension and pain it will hopefully relieve some. On a side note, when it comes to posture and sitting its not necessary ‘bad’ posture that is the problem, its the not moving and static postures. Get up and move around every 30-60 minutes, change from sitting to standing several times through out the day where possible, even changing from a regular desk chair to an exercise ball may also beneficial as well as going for a walk before, during or after work. In regards to treatment, you need to see someone who actually has training in treating the muscles, in my experience, chiropractors and physio therapists who actually have this are far and few between as its not covered in these course or programs and in my experience are often the ones who give bad advice like above. Over the years I have treated many people who sought help from other professionals; who even after 10 or more treatments with no ongoing results still continued getting treatment. Using the above guideline’s and the information below will help hopefully avoid.this happening to you. 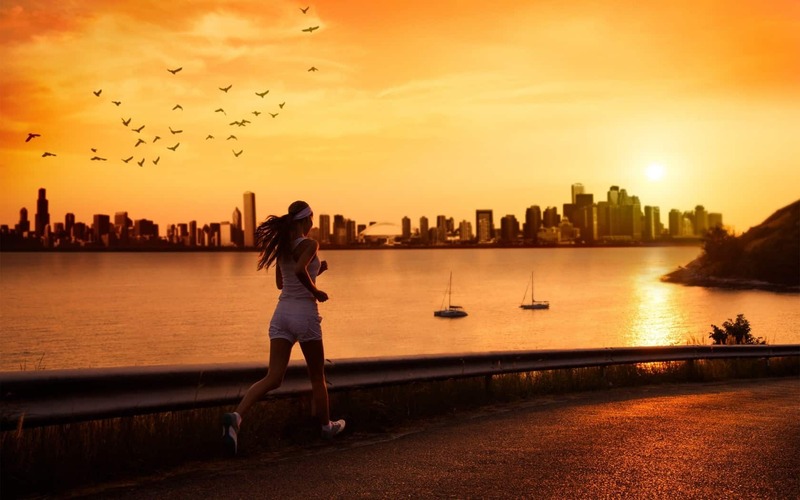 Your Chiropractor Sydney CBD & Waterloo Chiropractor has listed some factors that he has found influence how responsive a person may be to treatment, your Sydney & Waterloo chiropractic clinic’s specialise’s in helping people suffering from back pain & injury. Duration of complaint: it should be obvious the longer you have had the problem, more often than not it will require more treatment. For the average person the guideline above will apply, when I say “average” I am referring to people who may of only had the problems for 3-6 months, get a reasonable amount of exercise, average diet and stress levels. As a person gets older and especially when they don’t get regular treatment on there muscles they can become very stiff and tense, mainly due to lacking good blood supply to the tissues over time and generally require more time & effort to bring about suppleness to the tissue’s as opposed to someone who may be in there late teens/early twenties. When it comes to exercise it is really is important to exercise to your appropriate level of fitness and general health. Just like getting very little or no exercise can be a factor in back pain, doing too much high intense workouts such as pump class, spin class etc.. can be counter productive, especially if your muscles aren’t in the best condition or you suffer from pain or injury to begin with. Also having poor technique or mobility can exacerbate or lead to an injury. I find swimming a great form of exercise as it low impact, full body resistance that also has a cardio element. If you prefer gym based training or higher intensity training having a exercise physiologist or personal trainer guide you through the appropriate exercises may be necessary. This is something that very rarely gets talked about and definitely not something I was taught at university while studying chiropractic. It wasn’t until I started learning myotherapy (SLM) I was introduced to this fact. Personally I find it can be hard to determine if someone has a bad diet based on the feel of there muscles as there a so many different factors, but I can generally feel if someone has a good diet, although the might have muscle imbalances & tightness they also have a supple feel to them & have a bit of ‘give’ and generally don’t require as much time and effort to correct. Diets high in fresh fruit & vegetable, nuts, grains, legumes, fish & low in processed foods such as processed sugars/fats, red meat etc… are generally helpful in making your body more responsive to treatment. 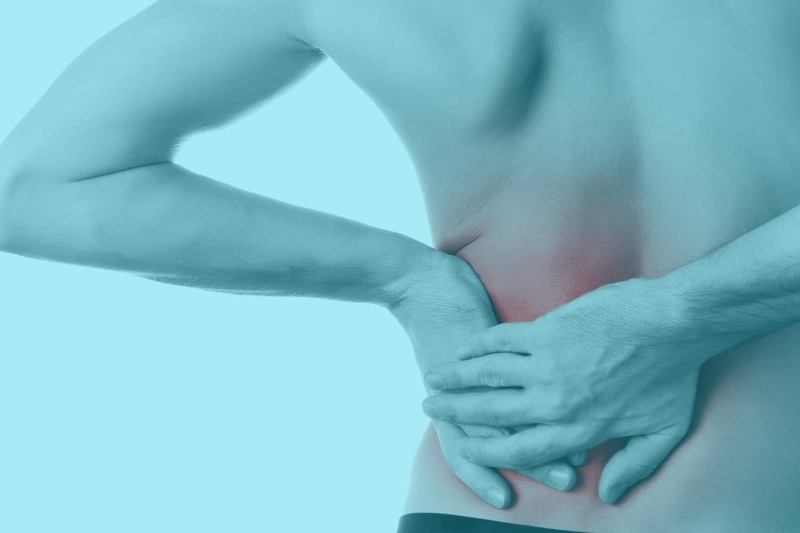 Its not uncommon for people suffering from back pain, especially chronic back pain to also suffer from stress, anxiety & depression and if this is the case seeing the appropriate health professional may also be required. Also ‘day-to-day’ stress is another major factor especially when it come’s to upper back, neck and shoulders, it important to realise this and take the appropriate steps in managing it. Your Sydney & Waterloo chiropractic clinic’s I take a wholistic approach when trying to help some with there back pain in order to get them feeling at there best in the least amount of time possible. Contact your Sydney & Waterloo chiropractor today for more information. Related Searches: Wateloo Chiroparctic, Waterloo Chiropractor, Waterloo Massage, Chiropractor Sydney CBD. Heat or Cold Therapy for Back Pain? Over the years as a chiropractor, myotherapist (SLM) & massage therapist I have noticed some confusion when it comes to using ice or heat on an acute injury or pain. A lot of pain sufferers are unfortunately incorrectly guided by other professionals in this matter, which I think is partly due to a lack of understanding when it comes to treating the myofascial system (myo= muscle) (fascial= connective tissue) & what treatment works, what doesn’t & why. I have written this article to help you make a better, more informed decision, not only with ice/heat but acute back pain in general. I am not going to go into the specifics of how I treat sciatica and disc injuries, which is difficult as each case can be extremely different from one to another, however; if you would like an overview of my approach & why I combine chiropractic with myotherapy (SLM) please have a read of my homepage or the services I offer. As a chiropractor working in Sydney’s CBD, i treat alot of desk workers who find there backs get stiff, painful and tired from a long day spent at the desk. If your finding sitting is aggravating your back pain, a technique i recommend to try is called stretch-sitting as demonstrated in the video below by the creator Gokhale Method; Esther Gokhale. 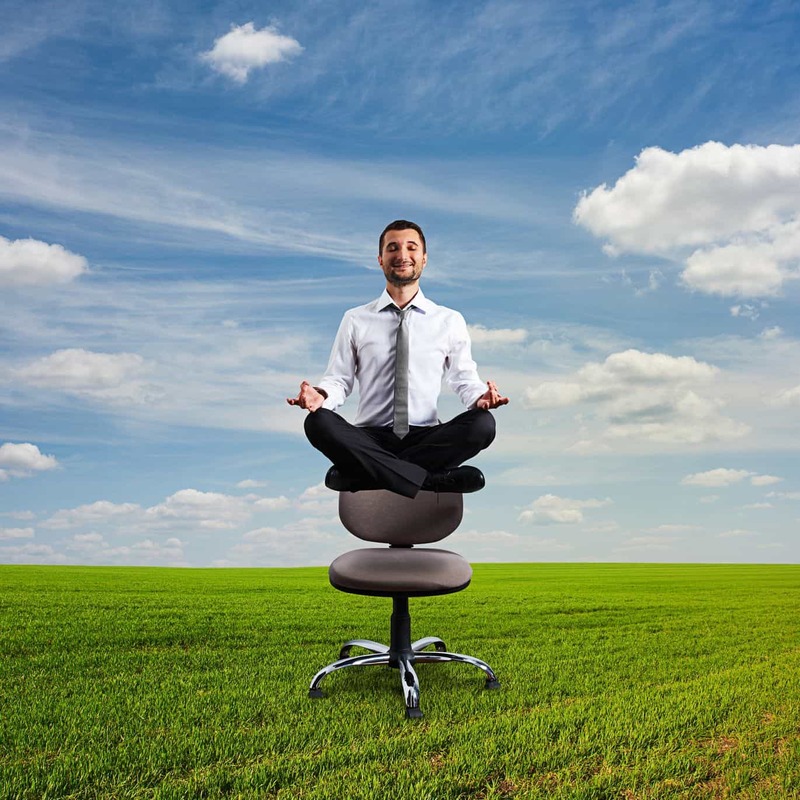 When most people try to sit with “good posture’ they usually force themselves to sit more upright with there shoulder’s pulled back, resulting in more tension in the muscles of the back and spine. Over the years I have seen many weird & wonderful ways to ‘fix’ posture, some of which have merit but many that ignore the simple fact that it is the myofascial (muscles & fascia) system which hold you upright against gravity & need to be balanced & functioning adequately so they hold you in a balanced manner. That’s why I combine chiropractic with myotherapy (SLM), SLM is a wholistic & corrective form of bodywork that restores length & function to your critical postural muscles so that your muscular system supports the chiropractic treatment of your spine & joints. 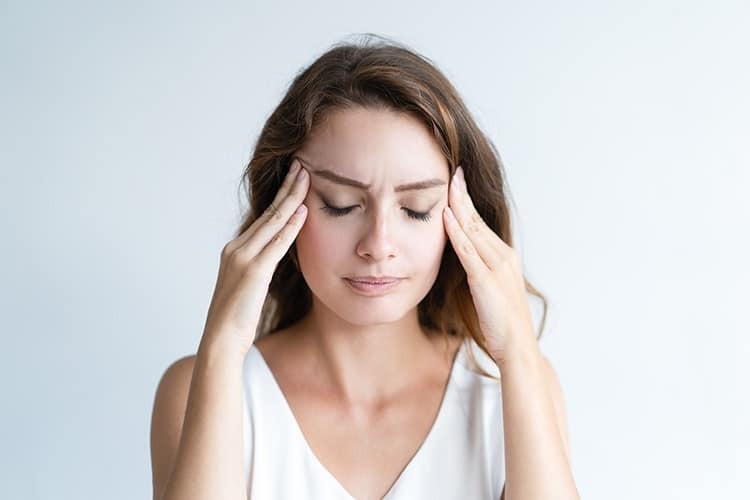 At Sydney Chiropractic and Remedial Massage, headaches and to a lesser extent migraines is another relatively common complaint that we deal with in our clinic. Depending on the the cause, duration, stress levels and other factors they may be easily resolved or may take some time. 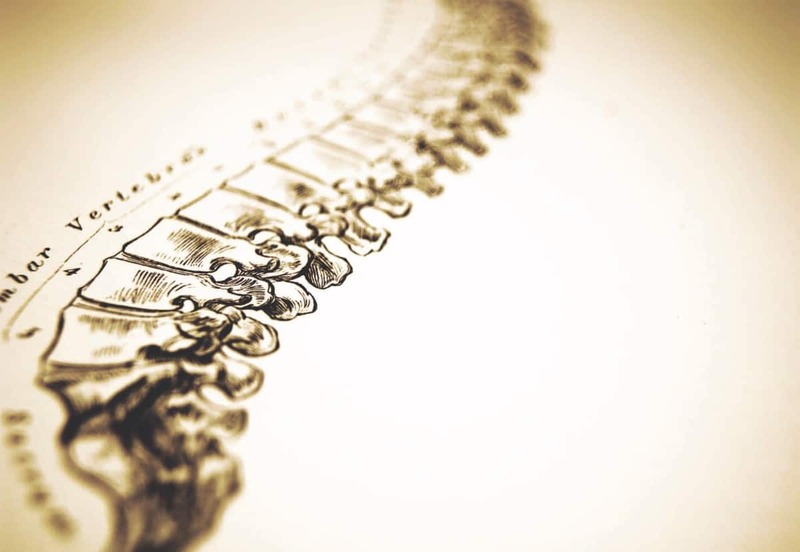 Our Sydney chiropractor, myotherapist (SLM) and remedial massage therapist has helped with many sufferers over the years. There has been some research done on specific treatment guidelines for chiropractic and the treatment for headaches & migraines.